The All-India area-weighted mean summer monsoon rainfall, based on a homogeneous rainfall data set of 306 raingauges in India, developed by the Indian Institute of Tropical Meteorology, is widely considered as a reliable index of summer monsoon activity over the Indian region. 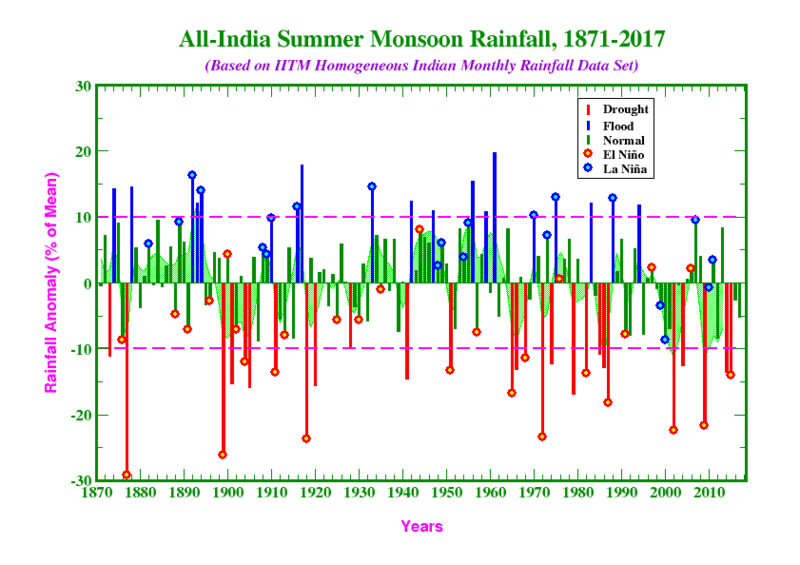 Long time series of this index since 1871 have revealed several interesting aspects of the interannual and decadal-scale variations in the monsoon as well as its regional and global teleconnections. This figure shows the time series evolution of AISMR anomalies, expressed as percent departures from its long-term mean, over more than a century in the past. Prediction of the future evolution of the monsoon activity, at least a season in advance, remains a difficult challenge. 1874, 1878, 1892, 1893, 1894, 1910, 1916, 1917, 1933, 1942, 1947, 1956, 1959, 1961, 1970, 1975, 1983, 1988, 1994. 1873, 1877, 1899, 1901, 1904, 1905, 1911, 1918, 1920, 1941, 1951, 1965, 1966, 1968, 1972, 1974, 1979, 1982, 1985, 1986, 1987, 2002, 2004, 2009, 2014, 2015. It is interesting to note that there have been alternating periods extending to 3-4 decades with less and more frequent weak monsoons over India. For example, the 44-year period 1921-64 witnessed just three drought years; during such epochs, the monsoon was found to be less correlated with the ENSO. During the other periods like that of 1965-87 which had as many as 10 drought years out of 23, the monsoon was found to be strongly linked to the ENSO (Parthasarathy et al., 1991). 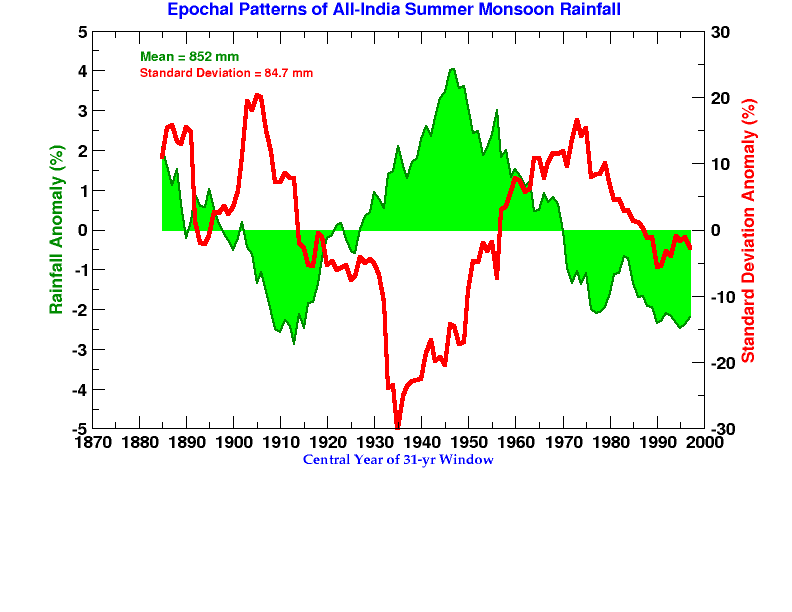 Monthly data on Indian summer monsoon rainfall during 1871-2014 are available on-line from HERE . Last Updated: Oct 01, 2017.